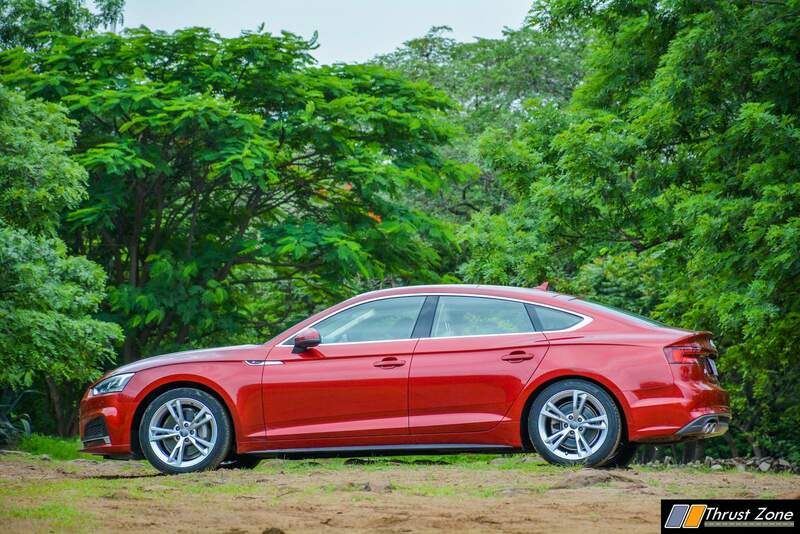 2018 Audi A5 Diesel India Review: Clearly, there is no denying the A5 stands out but does it have more to make it truly special? The German luxury car manufacturers are known for making some serious changes and produce vehicles which are different to serve almost every kind of customer that comes to their showrooms. There are many saloons, fastback, estates, cabriolets and performance version of the same cars aforementioned to make sure they convert them into sales. Audi is one of that manufacturer who has various body styles on offer and one of them has been termed into the brat pack. That is something that Audi wants to call their three variants of the A5. There is cabriolet, the S5 and the Audi A5. Audi sent us the A5 to live with for some time. Stay with us as well tell what it is like. The Audi A5 is one of the most different cars from its stable. The car has a muscular bonnet, a lot of creases and lines. The low, long, sleek and wide stance makes it stand out with typical Audi elements. The large grille, the LED DRL equipped headlights marks its signature design element. The projector beams make it to the car and there are no LED’s there. The side profile is very swoopy and coupe-ish. The rear is a fastback where it neatly integrates into the boot. The large LED tail-lamp with dynamic turn indicator makes it stand out every time you turn. The large 18-inch wheels have a sedate design to them. The body kit and side skirt makes it more sportier. The maroon color of our test car grabbed a lot of attention. Interior had the beige and black combo with dark wood inserts all around to make the car really stand out and sophisticated from the inside. The vents running through the entire dashboard, the screen in between which is fixed and the large virtual cockpit which is the entire instrument cluster dominates the front of the car. THe center console remains very Audi with a chunky gear lever, a rotary knob and the usual slidder buttons to control infotainment. Two cup holders, a bit of space in the front of them and a small slot for the key is a neat touch. There is a good amount of space in the center armrest to store things. The flat bottom steering wheel is just the right size. Quality and finish as always is great with any Audi cabin. Space in the back and boot is just about adequate and is almost on par with the A4. 480 litre is almost 100 litres less than its rival. The Headroom is a bit tight and the car continues to be a four-seater. There is a centre armrest with two cup holders to make things comfortable. Seats are supportive to a large extent at the front and rear to make things impressive. Lower back support could have been a bit better. Feature list includes, front seats electrically adjustable, Seat Upholstery in Leather/Leatherette on the Audi A5, 4 Way Lumbar Support, Auto-release function, 3-Zone deluxe automatic air conditioning, Interior mirrors with automatic anti-glare action, Exterior mirrors, electrically adjustable, heated, folded, automatic dimming. front and rear parking sensors, reversing camera and electronic parking brake. Practical bits include, Luggage compartment lid, electrically opening and closing, MMI Navigation plus with MMI Touch, Audi Virtual Cockpit as standard, high-resolution TFT monitor 31.2 cms (12.3 inches), 10 GB of flash storage, 21.08 cms (8.3 inch) monitor with a resolution of 1,024 x 480 pixels, Optional Audi Smartphone Interface, Optional Bang & Olufsen Sound System with innovative 3D sound Safety. There is also Audi Drive Select and a New Electromechanical Power Steering on offer. Safety kit includes Full-size 6 airbags, ABS , EBD & Traction Control, Cruise Control, Parking Aid Plus with Rear-View Camera, Tire pressure monitoring display, ISOFIX child seat mounting and Anti-theft wheel bolts are on offer. The ubiquitous 2.0 litre TDi engine with 190 PS and 400 Nm of torque came in our test car. The engine is mated to a 7-speed dual clutch gearbox which is as always seamless, quick and responsive to throttle inputs in a very sensitive manner. The engine has a bit of turbo lag below 2000 RPM and the gearbox is a bit hesitant at those speeds as well. However, the engine spins quickly, smoothly and freely to the redline, you don’t realize the jerks much as speeds build up. Mid-range and top-end power is excellent and it is happy cruising at any given speed in the triple digit zone. NVH levels are fantastic as with any given Audi. The engine was fairly new at 2500 km on the odo, so there was a bit more clatter than expected. Something that should settle down in next few thousand kilometres. Drive mode (dynamic) and sports mode of the gearbox make things eager to respond We got 13.1 km/l in our testing of highway and city which included traffic in both cities, Mumbai and Pune. Ride and handling is different with this Audi when compared to all other models. This is the stiffest riding Audi we have driven in a very long time. Despite that the ride quality is good, but not entirely plush seen in other Audi’s. The steering in response is a little more feedback rich but continues not to be entirely communicative. It is light and precise and tells you a bit more of what the front wheels are doing than before. The A5 is devoid of Quattro. The S5 and A5 cabriolet get it. Torque steer is well controlled, but we did notice understeer in good proportions than the previous FWD Audi cars. At this price point, it does deserve Quattro to make it more dynamic. Brakes are good and body roll is well in check. All thanks to 18-inch wheels which play a vital role. The A5 is part of Bratpack which is quite an exciting proposition in the Indian luxury car market right now. The A5 garners some serious attention on the road. It isn’t just the money and size that talks, it is the design and elements which are really well done this time by Audi on the A5. We only wish it had Quattro, at least as an option to make things more attractive as a package. At 50.2 lakhs ex-showroom Pan India, it does offer good value, but it could have been a bit more exciting. Nevertheless, get behind the wheel, experience the cabin and enjoy the tried and tested drive train to know why the Audi A5 makes more sense over its rival in any given criteria.